© The International Federation of Surveyors (FIG), 2016. This publication is the result of the workshop on “Responding to Climate Change and Tenure Insecurity in Small Island Developing States – The Role of Land Professionals” held in Christchurch, New Zealand 30 April – 1 May 2016 in connection with the FIG Working Week 2016. It includes a report of the seminar and a FIG Christchurch Declaration as the main outcome of the workshop. The workshop was organised to address the many distinct challenges that Small Island Developing States (SIDS) are facing in their pursuit of social and economic development and these challenges are compounded by the adverse impacts of climate change. The International Federation of Surveyors (FIG) has organised several regional forums on the role of land professionals in supporting SIDS. In 2010 a 2-day SIDS Seminar was held over five sessions at the FIG Congress in Sydney. The major outcome of this seminar was FIG Publication 53 (FIG, 2010). In September 2013 a follow-up symposium was held in Suva, Fiji that aimed to build upon the discussions in Sydney in 2010. The outcome of this symposium was the FIG “Suva Statement on Spatially Responsible Governance” (FIG, 2013). A key outcome of the Third international Conference on Small Island Developing States in Apia, Samoa (UN, 2014) was the Small Island Developing States Accelerated Modalities of Action (the ‘SAMOA Pathway’). International cooperation and genuine and durable partnerships were seen as critical to the implementation of sustainable development in SIDS. Building on these initiatives, FIG arranged this SIDS workshop in Christchurch, New Zealand. The workshop was organised by Dr. David Mitchell, Assoc. Professor at RMIT University, Australia with a lead team consisting of Prof. Stig Enemark, FIG Honorary President, Denmark, Mr. Tony Burns, Managing Director of Land Equity International, Wollongong, Australia, and Mr. Bill Robertson, Director of Bill Robertson Associates, New Zealand. FIG would like to thank the team for their great efforts in organising this workshop and also drafting the FIG Christchurch Declaration for consideration and adoption by the workshop. Finally, we want to convey our sincere thanks to all the delegates who travelled from various parts of the world to attend this workshop and whose active participation ensured the success. 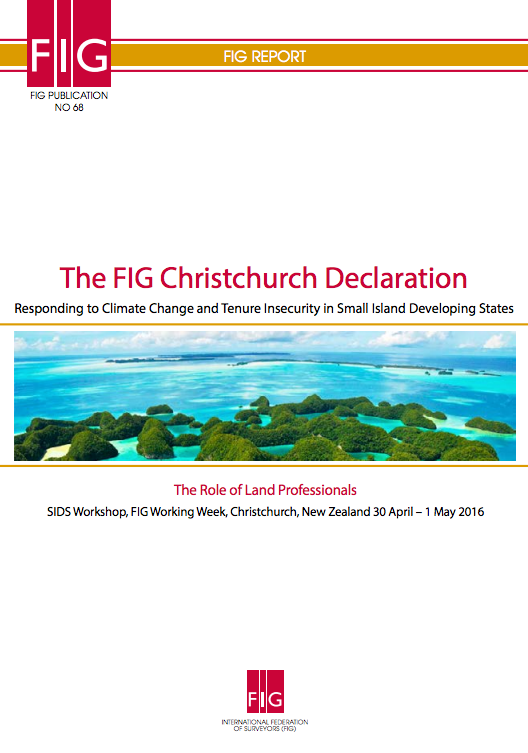 The FIG Christchurch Declaration will hopefully serve as a guiding document for the land professional in SIDS in facing the challenges of the future. FIG is committed to support this process.